Orkney based Scotrenewables Tidal Power has launched its 2MW SR2000, the world’s largest energy generating tidal turbine. 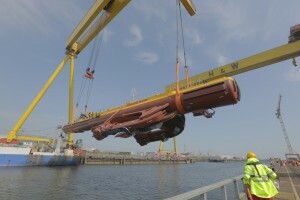 The company, which is at the forefront of the floating tidal technology sector, launched the 550 tonne machine at Harland & Wolff Heavy Industries Ltd in Belfast on Thursday May 12th. This is the first commercial scale machine the company has built. The turbine will undergo preliminary tow trials in Belfast Lough before being towed to the European Marine Energy Centre (EMEC) in Orkney to commence a grid connected test programme.